My Midlife Creativities: Which came first? I don't think this one needs labels! And, chicks just BEG for a collage! 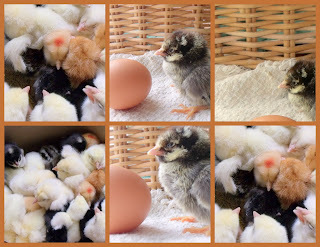 We order our chicks from Hoover's Hatchery in Iowa. They are delivered via US Postal Service. You can see them snugly packed for travel in the above photos. Soon, Paul Emma will gently dip their beaks in water so they learn to drink and they'll be set up under the heat lamp. 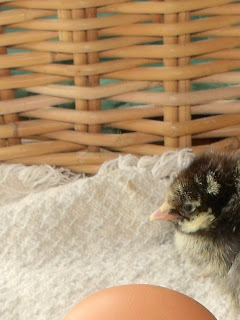 Eventually they'll head outside in their brand-spanking, newly-built chicken tractor! For now, until Paul gets home, they are in the living room in front of the heating vent. They are driving the cat insane!